Holy Family Parish was the third Catholic parish formed in Grand Forks. During the mid-1950's, the city of Grand Forks grew with the expansion of the University of North Dakota and the influx of personnel for construction and installation of the Grand Forks Air Force Base west of the city. These population pressures affected St. Mary's Parish, taxing church and school facilities. To relieve the situation and to minister to the Catholics on the south end of Grand Forks, Auxiliary Bishop Leo Dworschak of the Fargo Diocese announced on March 18th, 1960, that a new parish would be established south of 13th Avenue S. The new parish would be bounded on the east by the Red River, would extend half-way to Thompson, ND on the south, and half way to Larimore, ND on the west. Property belonging to the diocese to be used by the new parish was a double block located between S 10th and S 12th Streets and bounded by 17th and 18th Ave S.
Reverand John Axtman was named pastor and Bishop Dworschak asked that the new parish be named in honor of some mystery relating to Jesus Christ, suggesting Christ the Redeember. The steering committee of laymen was reluctant because of the Lutheran Church of the Redeemer in the vicinity. Bishop Dworschak suggested several other names and added that the final decision was up to Fr. Axtman and the parish. On Sunday, April 10th, 1960, a plebiscite was held on the name to be given the new Church. Of the 167 votes cast, "Holy Family" received the most of the 12 names suggested. The name, "Holy Family" was announced on May 2nd, 1960. Monsignor David Boyle of St. Mary's selected a steering committee of laymen to help Fr. Axtman plan for the new Holy Family Parish. These men were: Don Bohlman, Larry Brown, James Coleman, Thomas Dooher, Edward Gillig, Arthur Gustafson, Jack V. Lynch, Bernard McDermott, John A. McDonald, Thomas P. McElroy, Jr., Walter J. Mikkelson, Leo Mondry, Jerome O'Halloran, John O'Keefe, George Phelps, Sr., H.G. Ruemmele, James Ryan, and Dale Youngern. This committee began meeting on March 22, 1960, selected an architect, appointed a committee to find housing for the pastor and agreed on building a sixteen classroom school. 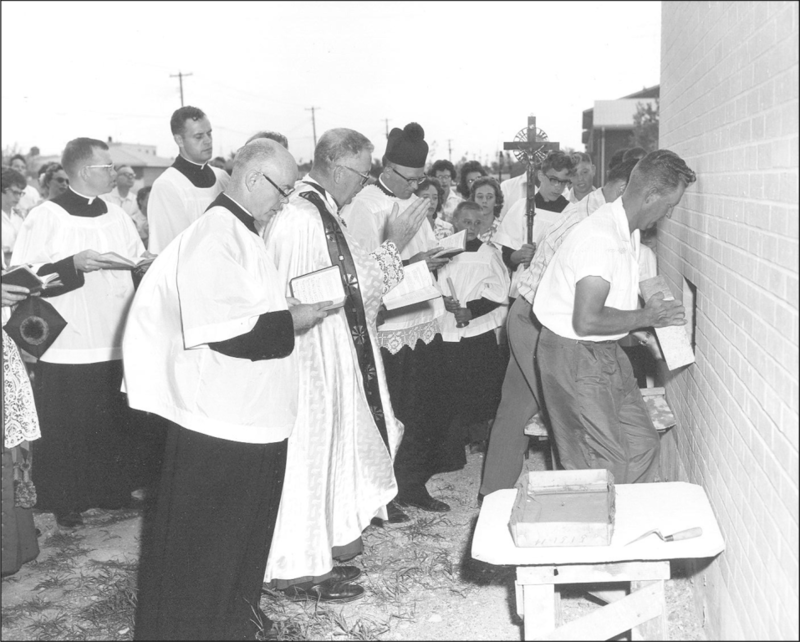 Officially the parish began on July 1st, 1960 with the first Masses being offered on July 3rd in the gymnasium of Viking Elementary School. Three hundred eighty eight families gathered with excitement, a little trepidation and much determination. Daily Mass was celebrated at the temporary rectory at 910 Campbell Drive beginning on July 21st. Fr. Axtman had begun residing at this rectory on June 29th, 1960. The make-up of the parish was a mixture of academic, business, farming, professional and working families....and "scads of kids". There were 915 children, including 455 pre-schoolers. We jokingly called ourselves "Wholly Family". On July 7th, 1960 Bernard McDermott and Thomas P. McElroy, Jr. were selected the first lay directors of the parish by Father Axtman. this was later ratified by the Bishop. According to Diocesan statutes, the Bishop, the Vicar General, and the Pastor were the other members of this Board of Directors. For almost sixteen months, Holy Family Parish celebrated Sunday Mass at "St. Viking's". Holy Day Masses, weddings, funerals, baptisms, and confessions were held at St. Mary's. Since the Blessed Sacrament could not be reserved at Viking, the number of Communicants was counted by the ushers at each Mass. As the ushers passed by each row of seats, you were to raise your hand to indicate the intention to receive Communion. There were folding chairs but no kneelers, therefore this directive was given: "There will be no kneeling at any time during Mass. Stand when the priest starts the Mass. Sit during the announcements...sermon...offertory. Stand from the Sanctus until after Communion. Sit during the ablutions, communion, and post communion prayers. Stand for the blessing, last Gospel, and prayers after low Mass." Since St. Mary's School was crowded and could not accept any more children from the new parish (nearly 200 children from Holy Family were already attending there already), it was determined that the school, including a convent, and a gymnasium would be built first, with the gym serving as a temporary church. A rectory would be added and then the church would be built. William Harrie, of DeRemer, Harrie, & Kennedy, Grand Forks was the architect. When the bids came in higher than the estimates, the steering committee and the pastor reluctantly eliminated eight classrooms and the basement under the school from the plans. Ground was broken for the school on March 23, 1961. Fr Axtman blessed the ground. Thomas McElroy, lay director representing the parish, turned the first spade full of dirt. Construction began April 4, 1961. In November 1960 the Finance Committee consisting of Ernest Boucher (Chairman), Dr William Powers, Dr. William Mullally, Melvin Scott, Hugh Bray, Jim Coleman, Lowell O’Grady, Bernie McDermott, Thomas McElroy, Robert Fortin, Curtis Malm, Jim Gaffaney, George Geatz, James Ryan, Carl Radloff, Julian Slominski, Jake Burckhard, and Dr. Robert Fischer met for the first time. They had a huge task before them. By June 14, 1961 the structural steel for the gymnasium was set in place; the walls of the school section were fairly well completed. And on July 9th the laying of the cornerstone of the school took place. This occasion was celebrated with a ham dinner by men of the parish, headed by George Phelps, Sr, under the structural steel of the yet roof-less gym. Dellas Kresl prepared the ham and 500+ people were served. The first Masses offered in our temporary church on October 15, 1961 at 7:30, 9:30,and 11:15 a.m. were very happy occasions. The main altar with its furnishing and pews were in place. The first Converts of Holy Family Parish were Mrs. Louis Bogan and Mrs. John Beachem. They were baptized on December 22, 1960. 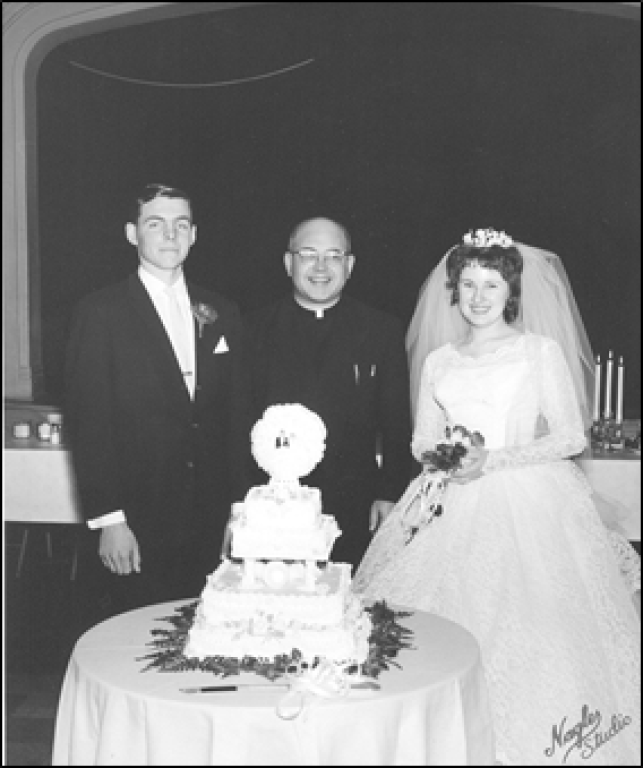 Sixteen Holy Family parishioners were married prior to October 1961 in various locations; the first was Kirk Smith (who married Joan Bushaw on July 2, 1960 at St. Joseph’s Church in Oslo, MN). 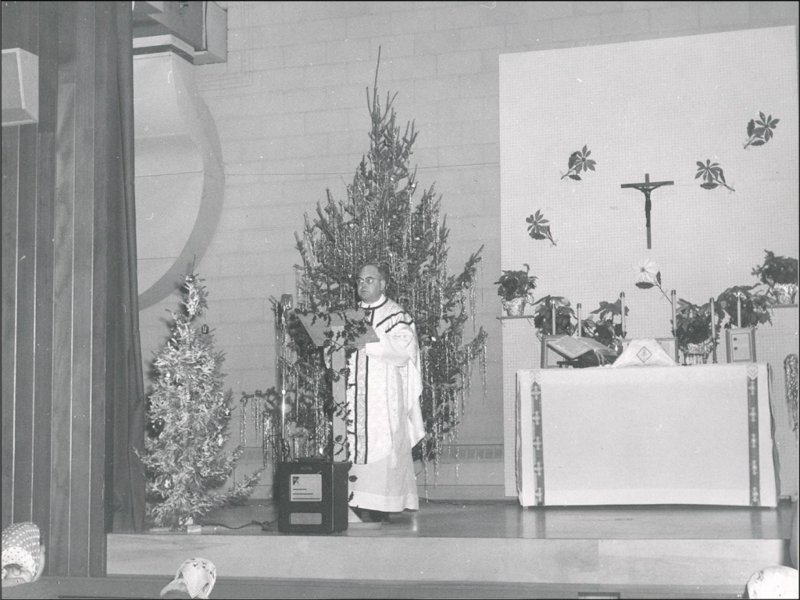 The first couple married in the new Holy Family Church building, on December 2, 1961 was James Uhlir and Angeline Valinski.